For over 2,000 years, people have been using Dead Sea mud & salt. 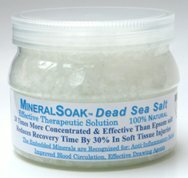 Our MineralSoak™ is proven relief for body aches. Relieves muscle soreness and extracts heat from joints and body parts. Warm Water Bath Soaks relieves bad backs, shoulders, knees, neck and ankles. America’s Acres, Inc. is not responsible for any declarations made in customer reviews nor when products are used in ways not suitable to their purpose, such as in larger amounts or for a greater duration than recommended.